Uncommonly sensible views on politics, history, and current events. With Obama's recent proposals to expand early education opportunities, anyone interested in the facts has to look at the Federal Government's track record when it comes to schools. 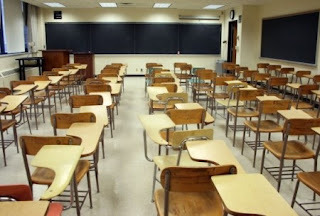 It's no coincidence that as the Federal government continues to expand its role in the education of America's children, more and more people are becoming concerned over the falling educational standards in our country. This begs the question: does increased government spending or involvement in education lead to better results for our students? 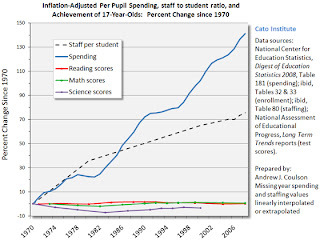 The chart below shows that while Federal spending per student has increased almost 200% since 1970, the reading, writing, and mathematical abilities of our students has stagnated. 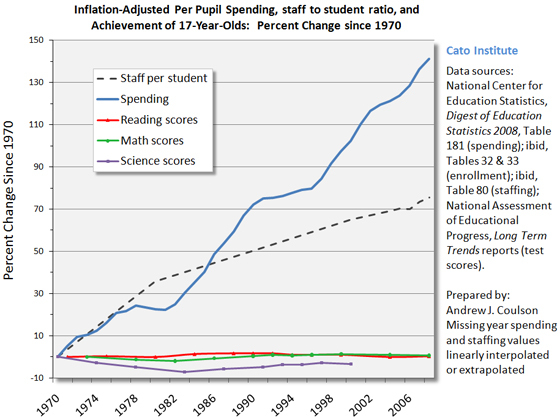 Government apologists can't even blame a lack of local spending on the failure of public schools. Since 1970, local spending has increased almost 150% per student. "In 2007-08, the average annual base salary of regular full-time public school teachers ($49,600) was higher than the average annual base salary of regular full-time private school teachers ($36,300)." 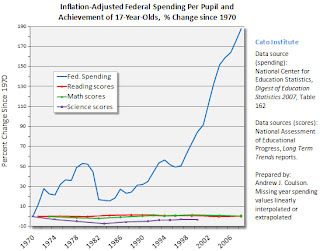 The Federal government now provides basically the same quality education it did in 1970, except now it costs three times as much. So no, you can't just throw money at schools to fix them, which seems to be the standard approach to problem-solving for our government. As usual, extra government spending just seems to go straight to the bureaucracy and special interest groups (teachers unions) instead of the students who are supposed to be benefiting from it. The answer is never as simple as "we need more teachers/money/equipment/etc." When the Federal government bureaucracy gets involved in education through schemes like the No Child Left Behind Act (which is generally considered a total failure), it prevents students from actually learning. The Federal government can't possibly cater its mission and goals to the individual needs of every single one of the millions and millions of students in the system right now. Instead, it uses standardized testing to gauge the students. That's the Federal government's only way of comparing two completely different students from two completely different walks of life. Since public schools' funding is largely based on standardized test scores, many teachers are forced to simply "teach the test." To do this, they must obviously neglect other parts of their students' education in order to spend time literally teaching the questions on the standardized tests. This assesses the students on literally nothing, not to mention this kind of teaching completely eliminates any passion for learning that the student may still have. Because public school's funding is also tied to student advancement and attendance, teachers and administrators are often forced to bend the rules. For example, a student who is in the 8th grade but only reading at a 6th grade level is considered satisfactory in some poorer schools. If a student is reading at grade level, they are considered to be excelling and may even be prematurely promoted to the next grade. In Baltimore, teachers are being paid thousands of dollars in bonuses to not suspend or expel trouble-making (and often violent) students so as not to jeopardize the schools' funding due to attendance. We should abolish the Department of Education (since it's completely inept and therefore useless) and remind our government that according to the Constitution, the Federal government has no authority getting involved in education. It's an issue left for and best handled by the states, local communities, and families. The states can very well provide an effective public school system without the teachers being mired down by useless mandates from politicians that don't know or care about the students themselves. Thomas Jefferson, in a proposed public education bill for Virginia, advocated giving three years of free education for all children beginning at a certain age. During these three years, the students would be taught reading, writing, and simple math. After that, only the best students of the class would be given free tuition as long as they kept their grades up, while others would be able to continue their education if they were willing to pay. If they weren't, at least they had the basic skills they could use to further their own education while they worked. While there were some problems with his proposal, perhaps something like his idea will be only way to partially save the country's public schools. The key is localization, not centralization. 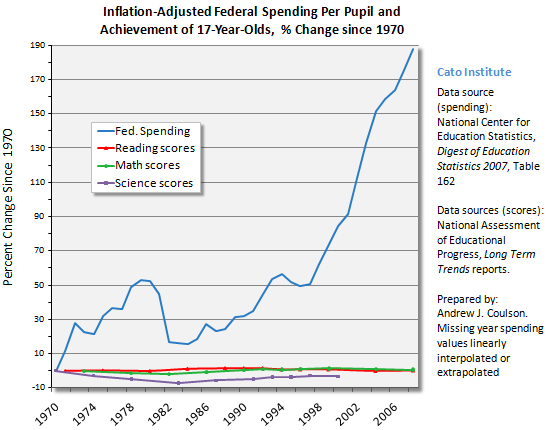 As you can see, teaching our kids is just a numbers game for the Federal government. It doesn't involve any tangible results, just numbers on a piece of paper and a hell of a lot of money. There isn't any fixing it either. High costs and awful results have plagued our public schools for decades, yet the solution from D.C. is more of the problem: government. Get ALL government out of education. State governments are nearly as inept, wasteful, and harmful to outcomes (but of course the Federal government takes it to a whole other level of absurdity). Community schools could easily be managed by a local non-profit rather than an elected school board. Better and cheaper. "A man is no less a slave because he is allowed to choose a new master once in a term of years." 4 Myths About "Assault Rifles"
You may reproduce my posts as long as you give proper attribution (Simple Facts and Plain Arguments) and provide a link to this site. Simple Facts and Plain Arguments. Simple theme. Powered by Blogger.